What is better to use on icy sidewalks? Sand or salt? The answer is both. Sand and salt serve two separate functions. Sand creates traction on the ground while salt raises the melting point of the ice. Both of these options are fairly inexpensive and abundantly available. However, sand and salt can be very damaging on a residential landscape if used in excess. For homeowners with boulevard gardens or permeable pavement, sand and salt may cause more damage than good. What effect does salt have on plants? Excess amounts of salt on plants can be severely damaging to the growth and overall health. When the ice or snow melts in spring, all the salt drains into the soil and is absorbed into the plant. Plants and grass near walkways, driveways, and streets are especially susceptible. The plant’s growth can be stunted, leaves withered, and in extreme cases you may find plants completely dead. Learn how to protect plants from winter damage. Try using these plants in boulevard gardens or areas next to walkways and driveways. 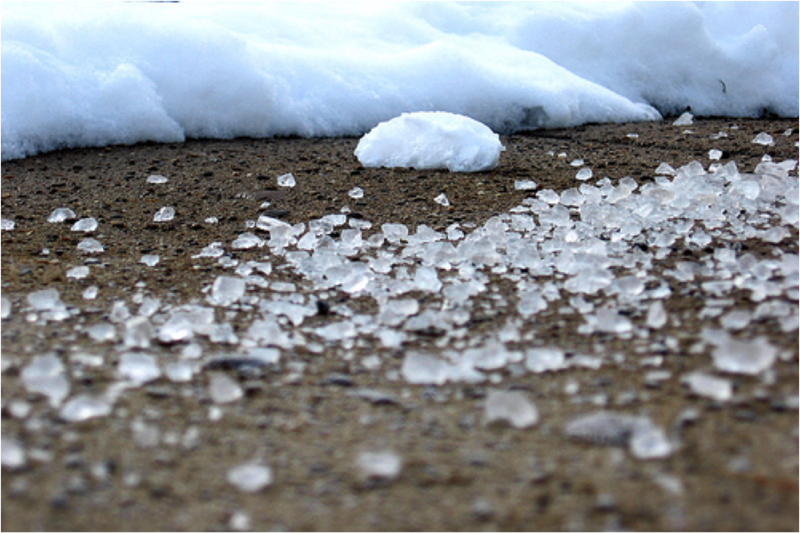 The main product used for de-icing salt is Sodium Chloride (Rock Salt). This is the least expensive product and can be found at gas stations and hardware stores. However, there are other products that have less of an impact on plants. Calcium Chloride is less corrosive and less damaging to plants, but is slightly more expensive than Rock Salt. 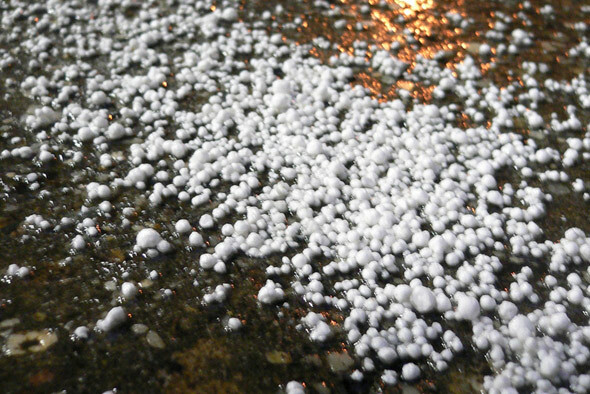 Calcium Chloride is more effective in colder temperatures too. Unlike salt, sand will not dissolve into the water and melt away. Instead, large deposits of sand will be left on the edges of streets and driveways. This is a minor inconvenience in most cases, but can sometimes cause drainage issues in low spots receiving lots of runoff. Sand on permeable pavement however will cause a much larger problem. Permeable pavement is designed in a way that allows water to flow through joints and permeate into the soil. 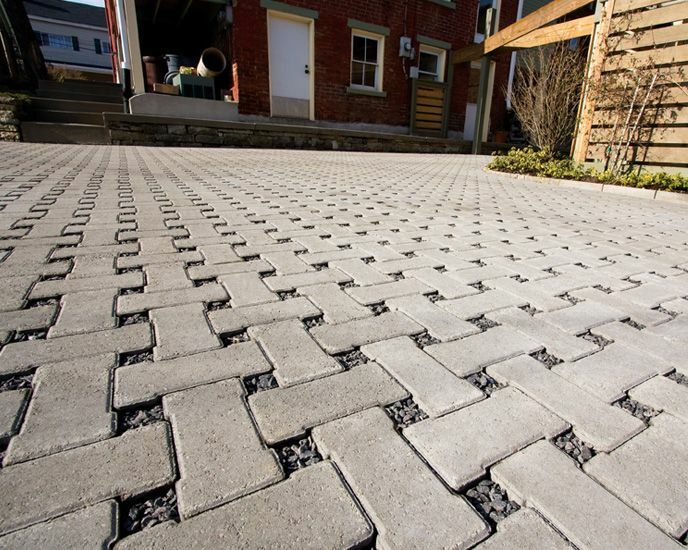 It is becoming more common to use a permeable pavement design on walkways and driveways. If sand is spread across a permeable driveway, it will fall through paver joints and eventually clog the whole system up. Water will no longer drain properly and the permeable pavement won’t serve much of a function anymore. In other words, DON’T USE SAND on permeable pavement! There are some maintenance tricks to fix clogging, but is easier to just avoid it in the first place. More more information on permeable pavement and sand application, click here. Using salt and sand on icy walkways is a no brainer, but it may cause more winter damage than good by the time spring rolls around. Avoiding sand and salt in a landscape design will extend the life of surfaces and plants. Use salt tolerant plants and salt alternatives in those high risk areas of the yard.